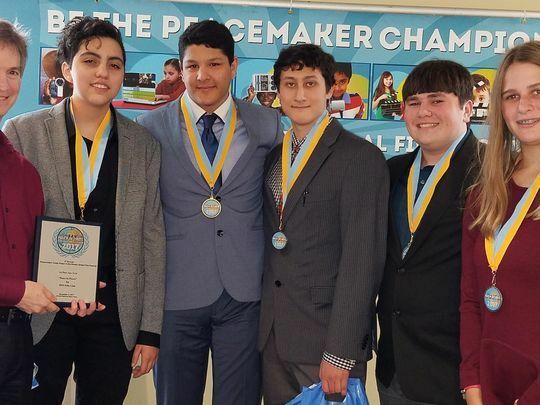 Ridgewood High School’s Film Club won first place for its “Peace in Pieces” project for the Peacemaker Corps’ Peace in the Streets Global Film Festival. It’s the first time the club participated in a contest. The club received the award at a luncheon held on Nov. 9 at the United Nations. New York City officials, UN dignitaries, parents and friends were in attendance. The Peacemaker Corps Association, a non-governmental organization that seeks to promote peace, tolerance and nonviolent conflict resolution around the world, was founded in 1997 through a collaboration of Friends of the United Nations, the Department of Housing and Urban Development and the Simon Youth Foundation. The purpose of the festival is to empower and give a voice to young people who may not otherwise have access to filmmaking technologies. “Storytelling has become the non-threatening, user-friendly go-to tool that’s adaptable to so many situations,” said Suzanne Harvey, executive director of the festival. The theme for this year’s festival was peace in the streets from youths’ point of view. A distinguished international jury panel selected the winners of the contest. “Clearly the film touched a nerve in all,” Harvey said. “Peace in Pieces” is about “three people of different cultural backgrounds and sexual orientations expressing their individual voices about their position in society, taking a stand against discrimination and prejudice,” said Srinjoy. The club spent two months brainstorming the film’s plot. “We wanted to make something powerful that gets our message across efficiently,” Srinjoy said. The club finally chose a storyline an hour before they were set to start shooting. The club placed first in the category for participants aged 14-18 years old. The festival received entries from students in six continents and more than 14 countries. The UN also gives winners the opportunity to collaborate with other filmmakers across the world.